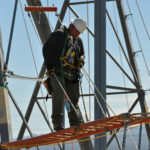 Working at Height safety breaches are on the rise, according to new figures released by The Building Safety Group (BSG). A rise of some 13% in the number of ‘Working at Height’ safety breaches has been recorded on construction sites in the last quarter compared with the first quarter of 2018. The numbers also reflect an increase in fatalities from workers falling from height. HSE statistics show there were 35 ‘falling from height’ related deaths in 2017/18, up 40% compared to the previous year. Other common causes of fatal injuries included being struck by a moving vehicle (26) and being struck by a moving object (23). Falls through fragile surfaces, particularly fibre-cement roofs and roof lights account for the majority all ‘fall from height’ fatal injuries in the construction industry. Workers undertaking roof work and building maintenance can die or be permanently disabled when they fall through fragile surfaces. Click here to find out more about the in-depth training available from Health and Safety Training Courses.